I am a PhD-student (defending my thesis now in June – puh!) working with Elin at the Geophysical Institute, University of Bergen, working on the exchange of water masses between the continental shelf and the deep ocean in the Southern Weddell Sea, Antarctica. Based on idealized modeling and moored observations, I study mechanisms that can bring warm water of oceanic origin onto the continental shelf and contribute to basal melting of the ice shelves. Furthermore, I study the production and export of cold and dense shelf waters, which overflows the Filchner sill, mixes with off-shore water masses and forms Antarctic bottom water. Antarctic bottom water is an important driver of the global thermohaline circulation, and is found near the bottom, in the large oceans. Tomorrow I’ll tell you about one of the articles in my PhD-thesis that just got published! We have presented all the scientists that are involved in the project, but still haven’t introduced the two most important people: Samuel and Thomas without whom we would not have been able to conduct the experiments. Today, part 2: Samuel Viboud, for Thomas see here. Samuel is an engineer in experimental techniques on large instruments and has been working at LEGI since 2001, when it was still at another place in Grenoble where Elin, Anna and Adrian conducted experiments about 10 years ago. To be in charge of the rebuild of the Coriolis platform was the most exciting event for him. Samuel is the technical director of the Coriolis platform and the head of the mechanical department at LEGI. Thanks to his creativity, technical know-how and sense for innovation, he received the well-deserved “Médailles de cristal” from CRNS in 2015. Today, part 1: Thomas Valran. Thomas is an engineer at the Coriolis platform and has been working for LEGI since March 2016. During his diploma in industrial engineering at the “Ecole nationale supérieure des Mines de Saint-Etienne” he worked as apprentice engineer for Schneider Electric. 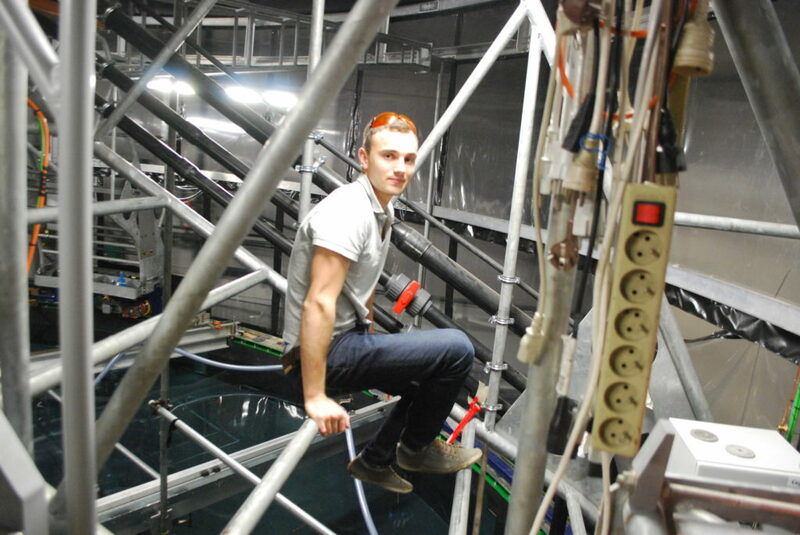 At the Coriolis platform, the most exciting part for him is to work for many different projects that never make the job boring. Due to his experience in climbing he moves on the supports of the platform very gently despite the high rotation speed. In his spare time, Thomas likes to go on road trips with his motorcycle or help at his parent’s farm where he grew up and where there are about 100 cows to take care of. JB Sallée is an oceanographer interested in the dynamics of the ocean and climate with active research efforts on the study of the Southern Ocean and Antarctica shelf circulation. 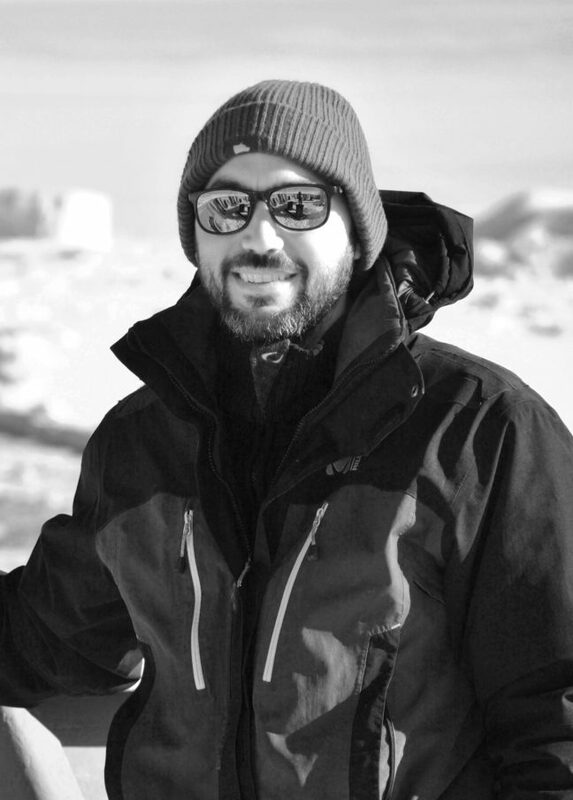 His research mostly focuses on the observational connection between the ocean surface and the deep ocean interior, with particular emphasises ocean ice-sheet interaction as well as on heat, salt and anthropogenic carbon sequestration in the Southern Ocean. His research tackles questions from oceanic turbulence to large-scale ocean circulation, as well as on the impact of ocean physics on biology. 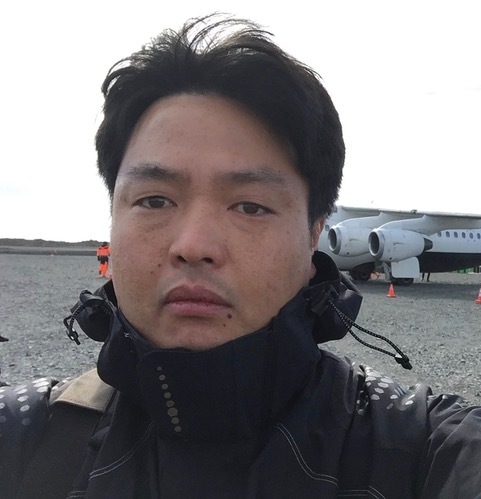 My name is Tae-Wan Kim and I’m a senior research scientist at the Korea Polar Research Institude, where I’m in charge of physical oceanography in Southern Ocean. My research interests center on (1) the ocean circulation in continental shelf of Antarctic coastal region and (2) heat and mass balance between ocean and ice shelves. I joined my institute in 2011 and participated 8 times Antarctic and Arctic surveies. In Amundsen Sea of West Antarctic, my field programme involved the measurement of hydrography and ocean circulation using the shipboard CTD, ADCP and long-term ocean moorings. Espacially, I measured ocean current, temperature and salinity more than 2 years in front of Ice Shelf. From this data, we can identify the variability of ocean circulation and heat and mass balance between ocean and ice shelf. When I am in Grenoble, I want to improve my understanding on the ocean circulation process in continental shelf. This experiments using the coriolis platform will give a good chance for me! 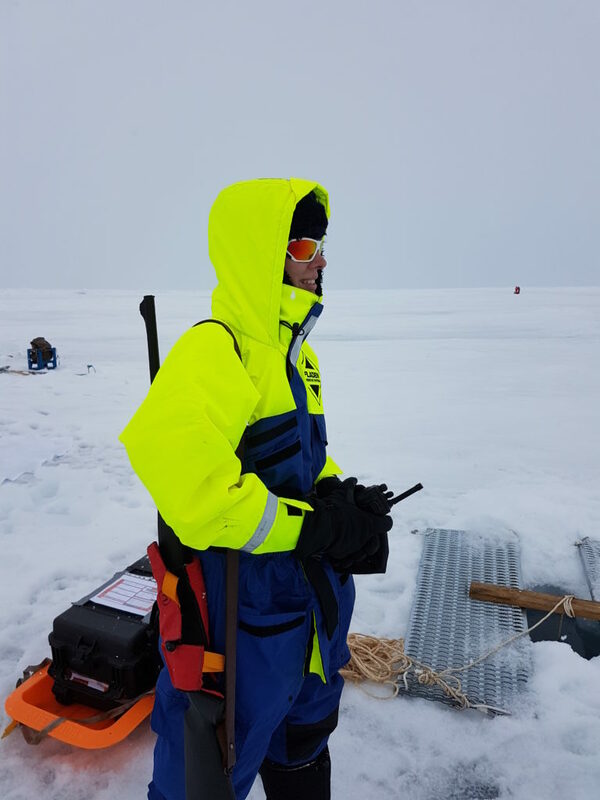 My name is Adrian and I’m a senior research scientist at the British Antarctic Survey, where I study the interactions between the ice sheet and the ocean that surrounds it. The particular focus of my research are the physical processes that control the rate at which the ice melts into the ocean waters and the impact that has on both the ice sheet and the ocean. 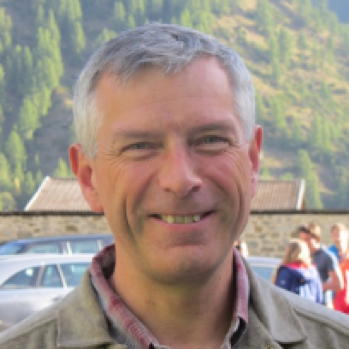 I joined BAS in 1985 as a glaciologist with a background in physics and geophysics and initially undertook three seasons of fieldwork on Ronne Ice Shelf, a vast body of floating ice covering an area equal to that of France. My field programme involved a long over-ice traverse, starting 800 km from the coast, where the 2-km-thick ice first goes afloat, and finishing at the front of the ice shelf, where the now 200-m-thick ice breaks off to form icebergs. The thinning of the ice during its progress toward the calving front results from a combination of ice flow, as it spreads out over the surface of the ocean (much like a drop of oil would, only very much slower), and melting from the ice shelf base, where it is in contact with the underlying seawater. Using a series of glaciological measurements that I made at regular intervals along the traverse, I estimated the rates of melting and freezing that must be occurring at the ice shelf base, then developed a simple numerical model of the ocean circulation beneath the ice shelf to explain those results. The problem of ice‐ocean interactions has remained the primary focus of my research efforts throughout my career. In recent years I have been mainly concerned with the study of how ocean-driven melting of the much smaller ice shelves of the south-east Pacific sector of West Antarctica is controlling the rate at which ice is being lost from that part of the ice sheet. The resulting thinning of inland ice there currently represents Antarctica’s main contribution to sea level rise, so understanding the processes that drive it is crucial for making reliable estimates of how much further sea levels will rise in the future. I’ve used numerical models of the ocean and sent Autonomous Submarines beneath the ice to study the ocean circulation that carries warm water to the ice and takes meltwater away. These studies point to the need to understand better the complexities of the ocean circulation near the front of the ice shelf. The currents that cross the ice front determine how much heat is available to melt ice from the ice shelf base, but are difficult to observe. That’s why I’m interested in these laboratory experiments. With the geometry of the tank, its rotation rate, and the forcing on the circulation precisely known, we can begin to understand the fundamental controls on the cross-ice-front circulation. 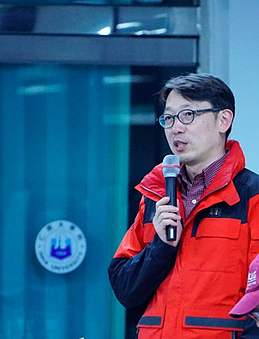 Ho Kyung Ha is an assistant professor at the Department of Ocean Sciences, Inha University, Korea. His research interests center on (1) the ocean circulation and (2) associated particle transport in water column. Research has included the study of such diverse areas as rivers, estuaries, continental shelf, and Polar Oceans. Using the long-term mooring system, he is seeking to understand the ocean circulation and hydrographic features. Most recently, he has studied the intrusion of warm water masses, which might be a potential heat deliver to under-ice system in the Arctic and Antarctica. He is analyzing the moored time series data in the view of the teleconnection of climate change signals between low latitude and Polar Oceans. In the field of particle transport, he has developed an acoustic inversion method to estimate the concentration of suspended materials and the flux. The developed acoustic techniques and approaches are being applied to the biology to monitor the transport of organic matters and migration of zooplankton in water column. Anna is a Professor of Physical Oceanography at the Department of Marine Sciences, University of Gothenburg. 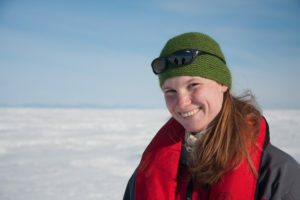 Her research focus is in the field of Polar Oceanography, mostly in the Southern Ocean. 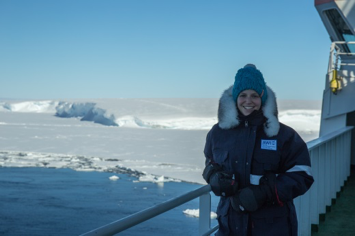 Specifically her research investigates several aspects of dynamics of polar seas including physical oceanography, ocean circulation, topographic effects, ice shelf melt processes and air-sea-ice interaction. When Wåhlin was appointed professor in 2015, she became Sweden’s first female full Professor of Oceanography. 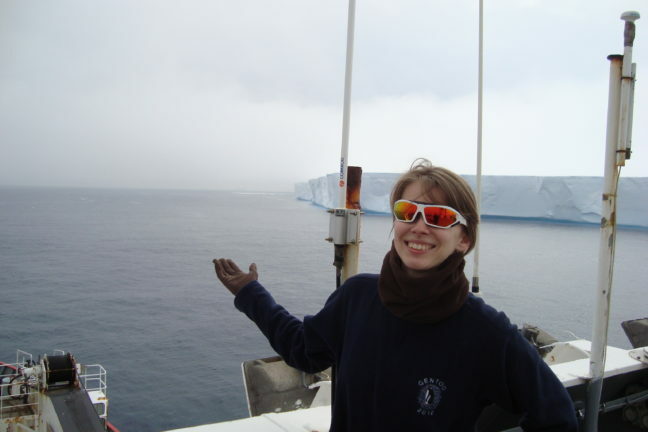 Wåhlin was between 2015-2017 co-chair of the joint Scientific Committee on Antarctic Research (SCAR) and SCOR initiative Southern Ocean Observing System (SOOS). She is an Associate Editor of the journal, Advances in Polar Science and member of IOW scientific advisory board (2016-2019). 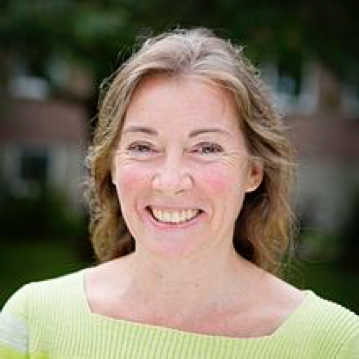 Wåhlin’s awards include being a Fulbright Scholar (2007-2008), receiving a Crafoord Research Stipend from the Swedish Royal Academy of Science (2010) and being a SCAR visiting professor (2013). Hi reader! My name is Céline Heuzé (pronounced sort of ‘ozé’), and although I am French this is my first time in Grenoble. I come from Dieppe, on the beautiful Normandy coastline, with high chalk cliffs, very large tides, and powerful crashing waves during the strong winter storms… I guess that’s why I ended up as an oceanographer. I did my PhD in the UK at the University of East Anglia, and moved to Gothenburg in southwest Sweden two years ago to work with Anna Wåhlin. I actually don’t study Antarctica. Well, I did during my PhD, but then I got more interested into the Arctic and have been looking more and more at it these last years. The reason why I am in Grenoble today is that in fact, it does not matter which region you look at; the same physics laws apply to both the Arctic and Antarctic. You just need to remember that you are in different hemisphere and whack a minus sign here and there. So I am using Elin’s and Anna’s experiments to understand the circulation under a Greenland floating glacier that I measured in 2015: Petermann Glacier, famous for its large calving events in 2010 and 2012. And also because I can act as a French-Swedish-English translator to Anna, while enjoying some nice food and weather! My name is Svenja. I am currently a PhD student in physical oceanography at the Alfred Wegener Institute, Helmholtz Centre for Polar and Marine Science in Bremerhaven, Germany and my work is actually very much related to the experiments which we will perform on the Coriolis platform. Even though I will not use the data myself, I am very excited to be part of the team in Grenoble. a great joint program. From the beginning on I was drawn to the field of oceanography as the vast oceans fascinate me and there is still so much left to explore. During my Bachelor I had the chance to participate in a research cruise to Antarctica for the first time; a place that is truly breathtaking. So, I went again a second time during my Master and, what a surprise, ended up doing my PhD in the topic and got to go there a third time J In my work, I am studying the flow of warm oceanic waters toward the ice shelf by using observations and a numerical model.